Reorganize Data for Excel allows to quickly and easily perform transformation operations on Excel data for dividing and uniting tables and preparing data for pivot table reports. Pivot tables are a powerful and convenient way of presenting and analyzing data in Excel; however it is often necessary to transform the data to be suitable for the desired pivot table report. 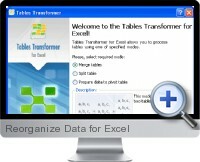 Reorganize Data for Excel can reorganize the data accordingly based on criteria set in the interface. Reorganize Data for Excel can intelligently split data by dividing a range into several tables based on criteria of specified rows and unique values of cells in specified columns. Reorganize Data for Excel can unite data from two sources into one table based on grouping criteria. This option also allows to choose the data to be included into a new table as well as to choose the column and row arrangement of the new table. All of the data in the newly created table remains unchanged.